Discussion in 'SRD Sprint Cup Offline League' started by Zoom, Nov 2, 2018. 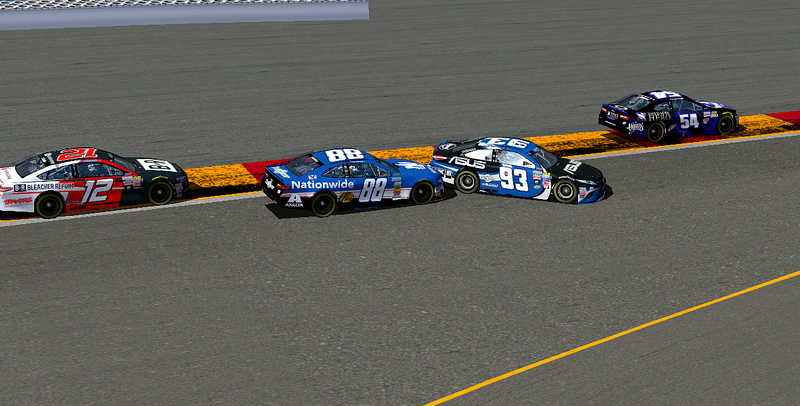 Lap 26: Nixon the first to jump out of line on the restart. Into turn 1 and the 79 looks like he will get a 2 for 1 under braking getting by the 7 and 41. The rest of the field now fanning out for turn 1 and we have a car around right in the middle of the track. Mallon in the 93 has gone around but luckily escapes getting any damage. Caution comes right back out. Bleskachek will be the leader. Smetana pitted on the restart and now looks to be in good position with that caution coming out. The 5 team might be able to stretch it to the end on fuel from here. Looking over the replays and we see that Mallon got a little help in his 360 spin. Caudill a little late on the brakes for turn 1 tags the 93 in the left rear and sent our #1 seeded driver around in front of the field. Tough break for the 93 team as they were up to 11th from 35th in the first half of the race and will now have to make another charge through the field. A bunch of cars stay out but we do have several drivers coming down pit road. This is just barely outside the window but with another caution and some fuel saving it might be enough to get them to the end from here. Bleskachek, Missimer, Merzlak, Busch, Johnston, Farrell, Gegner, Hawkins, Blanford, Smetana, Llamas, DeCosta, Joyce, Wichelman, Harris, and Mallon the drivers on pit road. That leaves the lead in the hands of Darren Ingram in the 2 car who managed to sneak around Lennox on the restart. Getting ready for the restart, here is the lineup with 15 laps to go. "Car feels good. Just trying to be smooth." Lap 30: Green flag flies and we are underway once again. Ingram leads the field down to turn 1. Front runners keeping it single file but here comes the 81 of Anderson. He'll dive up the inside of Caudill and Root. Anderson quickly up 2 positions as the field now races up through turns 2 and 3. Nixon on the attack for 2nd moves to the inside into the bus stop on Lennox. He'll take over that spot as Ingram jumps ahead by 8 car lengths. Wow now everyone that stayed out under that last caution is coming to pit road. They'll be able to make it to the end from here but that puts it all in the hands of the drivers that pitted under the last yellow. Lap 31: Missimer assumes the lead after having passed Bleskachek on the restart. Busch now the 3rd place runner with Merzlak and Gegner the rest of the top 5. Ingram comes off pit road first but is well behind the 16 drivers who stayed on track. They'll be counting on those cars being unable to make it to the end. Merzlak takes over 3rd with a pass on Busch into turn 6. Top 2 about 10 car lengths up on that battle. Lap 34: Missimer and Bleskachek in a league of their own out front. Merzlak with a big gap in front and out back running 3rd. Gegner has moved around Busch for 4th. Also all of a sudden the 93 of Mallon makes his way into the top 10, now running 9th. He's passed 7 cars since the restart and if they can make it to the end on fuel that will be a great recovery after being spun around just a few laps earlier. Lap 42: Missimer pulling away now as Bleskachek has slowed it down, possibly trying to conserve fuel. Missimer has a large gap back to the rest of the field, it might be time for the 68 to slow it down to avoid having to pit. Gegner in 4th is over 9 seconds behind right now. Just as I say that the 68 is out and comes to pit road. Bleskachek goes by to take over the lead. Gegner, Busch, Johnston, and Harris also now on pit road. Lap 43: Missimer and the rest of the drivers that just pitted going with fuel only! That's going to cut their time on pit road considerably and they might be within a chance of coming out ahead of the drivers that pitted just after the restart. Ingram making his way past the start finish line but it's already too late. Missimer is off pit road and headed up through turns 2 and 3. Looks like the 68 team may have the right strategy if the rest of the cars can't make it to the end. Lap 44: The rest of the 16 cars that stayed out are now on pit road. Looks like it'll be between the 68 and the 60. We'll see if the 60 team can get their driver on and off pit road fast enough to leap Missimer. Oh no it's a long stop for Bleskachek and Missimer goes by on the frontstretch. Merzlak going to get around Bleskachek on pit road as well and it looks like the 7 car will cycle into 2nd. Ingram looks like he will move into 4th on the track but is well behind the top 3 cars. Lap 45: White flag in the air for Missimer. 1 lap and he will punch his ticket to the 2nd round. A masterful strategy call from the pits looks like will take the team from the #15 seed at the start of the race to the #1 seed. 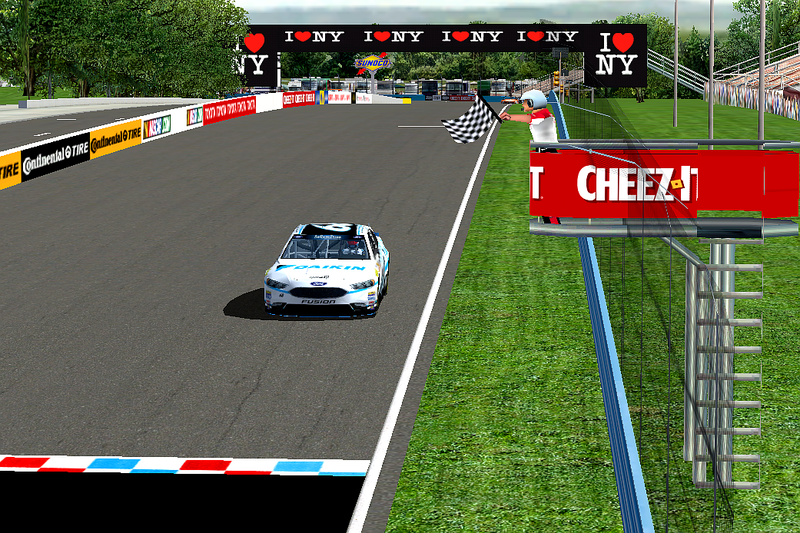 Off turn 7 and Kyle Missimer takes the checkers at Watkins Glen and will move on to round 2 of the playoffs. Merzlak a great drive in 2nd, Bleskachek 3rd, Ingram 4th, and Mallon with a miracle drive rounds out the top 5. Harkleroad and playoff driver Kunkel run out of fuel on the final lap and fall to 35th and 36th on the final lap. 2CC - "P4. Strategy didn't work out for us." 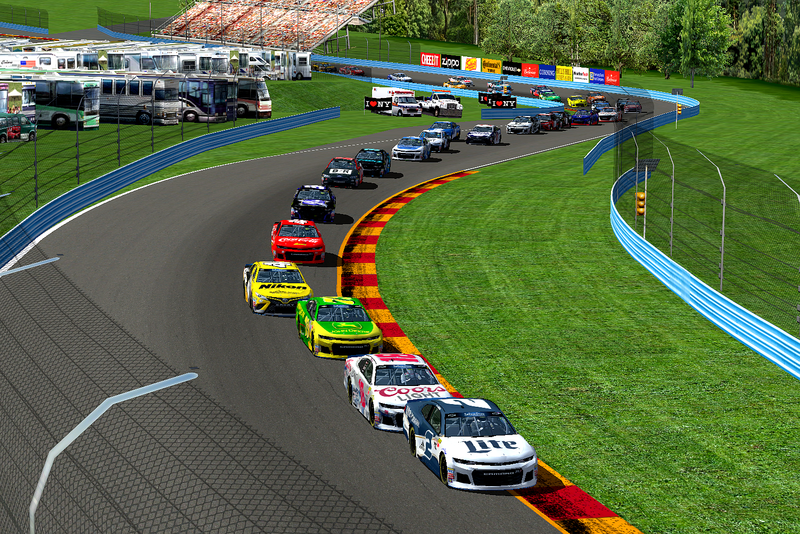 Missimer now locked into round 2 after taking the checkers here at Watkins Glen. Merzlak, Ingram, and Mallon end up with great results as well and put themselves well above the cut line after the first race. Engine failure for Peters and a lap short on fuel for Kunkel put both drivers on the outside looking in as we go to Armory Digital. Peters with a great run early in the race and picking up 9 stage points keeps the 00 well within reach of making the next round, sitting just 1 point below the cut line. Kunkel not as close but still just 11 points out with 2 races to run. Got excel updated and formatted it to look like the Score4 results. Everything is updated through today's race. ShadowKnight508 and Darren Ingram like this. "Another pit stop timing error caused us to finish worse than we should have." RB- So close today, it's the kind of run we needed to stop the bleeding and build some momentum heading into the rest of these races and 2019. So proud of this team they brought a great car this weekend. Got our first stage win and led the most laps, can't really complain about that. "What a drive, man. Started 28th, then we were dead last at one point - pit stop strategy sure came into play and we managed to pick up a 11th place finish. On to Armory Digital - a wildcard track that can determine who makes it further in the Chase and who loses out. Can't wait to take the brand new chassis we just built a few weeks ago with us!" We mismanaged our fuel situation and got burnt hard. Hate it for this Hoonigan racing team, they gave us a real good car today to at least get us a top ten if anything, obviously this isn't the finish we wanted but we've got two races to make it up. @BrendonH12: "We ran a pretty clean race today - didn't get the finish I think we deserved thanks to pit strategy though. Gotta thank Coca-Cola for being on board this week, Reese's, Verizon, SBN, and all our other partners. The boys back at HMS brought a fast Chevy, but at the end of the day, if you're strategy don't work out for you, I guess the speed doesn't really matter. Oh well, on to the next one..."
Will Anderson - #81 Once Upon A Time In 2Fort/Ghosts of the Past Ford Fusion (V2E Motorsports): "We didn't qualify very well for the race, but once the green flag dropped, our #81 Ford had some decent speed. My biggest weakness as a driver is my lack of consistency on road courses, and I feel like I was able to minimize the mistakes I usually make in this discipline of racing and we were having a solid run. We gambled on fuel when the others decided to pit in order to get track position with the hopes of getting a caution before the end of the race to help us make it to the end. Unfortunately, we came up a few laps short and had to stop for fuel in the closing laps, which dropped us to 31st at the finish. Not the finish we were looking for, but I am just happy that we brought the car back to the shop in one piece." (When asked if he blames his crew chief Bill Rocklin for making the fuel gamble that cost them possibly a good finish): "Not really. We were stuck in the middle of the pack for a good chunk of the race, so Billy made the call to stay out in order to get us closer to the front. I tried my hardest to save some fuel as the laps wound down, but we were still several laps short and had to pit for fuel after the caution we were hoping for didn't happen. So in the end, it's not his fault. We rolled the dice, and it didn't pan out for us. We'll head to Armory Digital next round and hopefully have a solid run there." (When asked about teammate Austin Spencer @ahspencer01 departing V2E Motorsports at the end of the season to retire from the SRD Cup Series): "Austin has been a good teammate this season and we tried working together as much as possible this season. It is a shame to see him retire at the end of the season, but I wish him the best in his future endeavors whatever they may be. We will be discussing back at shop with the boss @Saan Anguish and see what happens to that team for next season. Will another driver join our team for the 2019 season or will the team get shut down after Homestead? We shall see." Saan Anguish and ahspencer01 like this. "Solid run for today and I loved the aggressive pit call at the end. I gave up some spots early after that restart to try and save fuel but we just couldn't save enough. Had I known that I probably wouldn't have give up those spots so easily and maybe we could have finished a little higher in the final results. But hey a top 10 on a road course for me is a great result. It's a solid foundation as we build toward 2019, thanks to JEGS and Bass Pro Shops for their continued support and Chevrolet for there great cars. Let's go get'em at Armory." Strategy didn’t work out. Ah well.